An Igbo Lady who resides in Ghana is claiming she saw The leader of the Indigenous People of Biafra (IPOB), Nnamdi Kanu disguising in Ghana. 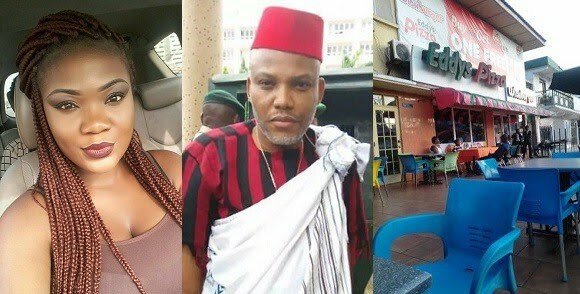 She claims she saw him at Eddys Pizza in Ghana at about 8:45 pm, yesterday, 11 of December 2017… She says when she saw him, she spoke to him at first, but then he refused to respond to her, not until she spoke Igbo and he responded. At First, she took to her Facebook wall to write yesterday, after her encounter with Kanu.